The Caped Crusader and friends team up to thwart evil in this 2-D beat-em-up. We're always in the mood for a cool beat-em-up, especially one that involves superheroes. Batman: The Brave and the Bold, coming to DS September 7th, is a 2-D side-scrolling brawler starring the Caped Crusader and his pals from the Justice League. Although it's too early to say whether this game will do DC Comic's finest proud, we can't wait to pummel bad guys using the old tricks of the trade. 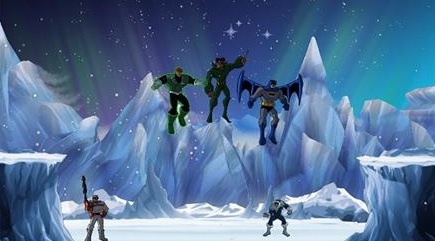 From what we can tell, Brave and the Bold features two character switching, as players tap the touch screen to give Batman a break while controlling another hero, such as Plastic Man, Robin, The Flash, Aquaman and Green Lantern. As expected, each superhero has his or her own signature abilities and powers, giving everyone a chance to cycle through Batman's utility belt, run super fast as The Flash and stretch to unbelievable lengths as Plastic Man. Meanwhile, the game has a diverse number of places to explore, including Gotham City, London, Science Island, outer space and other locales teeming with evildoers. In addition, Brave and the Bold looks great, with cartoon style graphics featuring detailed representations of history's greatest do-gooders and villains. We're also impressed by the attractive backgrounds, which feature an ice cave, city skyline and forest. That said, it remains to be seen whether this is just another mindless brawler, and we're still waiting to find out if there's two-person co-op. But for now, Batman: The Brave and the Bold is a promising action adventure game that may compliment its Wii counterpart. Look for more coverage in the near future. Same bat time, same bat channel.